Being on the road or the trail can be very tiring, so a good night's sleep is very much appreciated. Many will say that pillow is a luxury, and they’re right. However, it can make such a huge positive difference for you, and it doesn't even take so much to bring one. Nowadays, there are amazing designs that are meant for backpacking or light packing, so your sleep can be so much better. If you're on the search for the best backpacking pillow, you're in the right place. Choosing between a neck pillow or head pillow is a very personal decision, but it may also be dependent on your plans. A neck pillow is meant for the road, whether you’re in bus, train, plane, car, or any vehicle while a head pillow is more for backpacking backcountry or camping. For backpackers, pack size and weight are probably the two most important determinants of what to bring. Backpacking not only requires you to pack wisely but also to sacrifice some everyday comforts. Fortunately, many backpacking pillows in the market can make the journey more comfortable. Backpacking pillows or travel pillows, in general, are meant to be easy to carry around. However, not all backpacking pillows are the same, so consider the pack size and weight of the pillow before you buy it. The pack size is measured in volumes; you can get a pack size as small as 0.4 liters up to as big as 5 liters. Comfort is another factor to consider, especially since it’s the reason you want to bring a pillow in the first place. Don’t waste your space or add more pounds in your bag if it’s not even better than some rolled up clothes as a pillow. There are different types of pillows: inflatables, compressible, or a hybrid of the two. If you're looking for a space saver and a lighter backpacking pillow, consider getting an inflatable one. The good thing about this kind is you can control the firmness by the amount of air you blow in. If you want a firm support, just blow more air into it. Another advantage is that they are very flat and light when deflated, thus requires less space. If you decide to go for an inflatable, consider how easy it is to inflate. Great inflatable pillows will only take 3-4 full blows. They will also have some system that prevents air from getting out. You should also consider how well it stays in place when your head's on it and if it is noisy. The disadvantage of inflatable pillows is that they are not as comfortable as compressible. They are also a little noisy, depending on the material or cover of the fabric. Compressible pillows are filled with down feathers, foam, or synthetic fibers. You can also find some that have a combination of different fills. Down feathers are very soft, light, and they are also the most compressible, making it a very backpacker-friendly option. They are also the more expensive option. If you are looking for something cheaper, you can opt for synthetic fiber or foam fills. They are slightly heavier and less compressible, but still comfortable. A hybrid pillow takes the best of both inflatable and compressible. The top part is filled with down, foam, or synthetic fibers, while the bottom is inflatable. That way, your head rests on something soft, but you're still getting a lot of support from the inflatable portion. It also reduces the pack volume of a full compressible pillow. Compressible Pillows are the easiest because they don’t require any setting up or preparation.You simply have to take them out of their bags. Inflatables and hybrids need inflation and deflation, so consider how easy they are to inflate or deflate. Another thing to consider is how easy the pillow packs up. The bag or stuff sack should be just the right size that packing the pillow up is nice and easy. Finally, consider how easy it is to clean up. The Aeros Pillow Premium has a design that’s truly for backpacking. It has the smallest and lightest pack size, thus getting the best backpacking pillow title.There are two size variations - regular and large. The regular size inflates to 13.4 inches long, 9.4 inches wide, and 4.3 inches thick. If you find that too small, the large size inflates to 16.5 inches long, 11.8 inches wide, and 5.1 inches thick. There is a small difference in pack size and weight, but the large one, which is only 4 ounces, is still very compact and great for backpacking. Another great thing about this pillow is that it's very easy to inflate and deflate. The multi-functional valves are very easy to use and enable you to inflate with just a few breaths. Between the TPU bladder and the pillow case, there is a synthetic fill that makes it more comfortable. It also wicks away moisture, so it stays clean and comfortable. The most compact and lightweight pillow on the list. Very easy to clean and maintain. You can hand wash, and air dries it if necessary. The shape fits the head nicely. Firmness is easy to adjust. 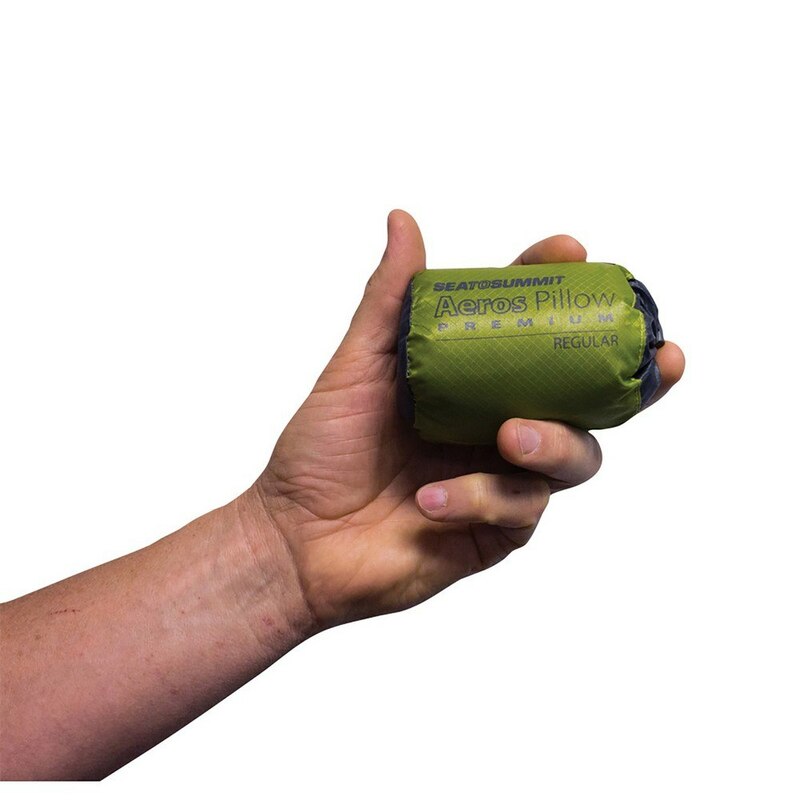 The Onwego Inflatable travel pillow is very popular among hikers and campers because it packs small and light, but has a decent size when inflated. It fully inflates into 20 inches long, 12 inches wide, and 6 inches thick. A cool feature from this pillow is that it self-inflates to about fifty percent firmness, so it requires less effort from you. Then you can adjust the softness/firmness quickly to your preference with the easy to use valves. For comfort, the pillow is designed with plush foam interiors and a soft pillow top. It also has a contoured design that comfortably cradles the head while supporting the neck. The pillow uses moisture resistant materials, with a slip resistant bottom part of the pillow. It comes in comes in many colors, so you have more options to choose from. It packs into a six by 5.5 inch-bag and weighs around 10.5 ounces. Self-inflating feature reduces the effort needed to inflate. The valves are easy to use and prevent air from coming out as you inflate it. Expands to a big pillow, and packs fairly small. Fairly comfortable for an inflatable pillow thanks to the contour and the interiors. Slip resistance could be better. I find that it still doesn’t hold in place so well. Makes noise even in the slightest of movement. The Thermarest Compressible Pillow is probably the most comfortable option on the list. However, it is also heavier and bulkier, so if you want a space saver and lightweight pillow, you’re better off with an inflatable. The Thermarest Compressible Pillow is ideal for car campers, short hiking or backpacking trips. It gives you extra comfort outdoors with just a little-added weight in your pack. This pillow is filled with open cell foam with a brushed polyester cover. Size medium expands to 18 inches long, 14 inches wide, and 4 inches thick, compresses into 2.6 liters and weighs about 9 ounces. It doesn't come with a bag, but it packs into itself, which is very convenient. There is also sizes small, large and extra large, so you can choose one that suits you best. In addition to the sizes, there are also many colors to choose from so you can personalize your pillow. Very soft but still supportive. It’s the most comfortable pillow on the list. There are four sizes and many colors to choose from. Very easy to pack and unpack from the sleeve. Easy to clean - it’s machine washable. It’s cumbersome and bulky. Not ideal for multiple days of backpacking/hiking. Holds odor and doesn’t wick moisture. Comfortlite Self Inflating Pillow has a microfiber top and a nonslip base. 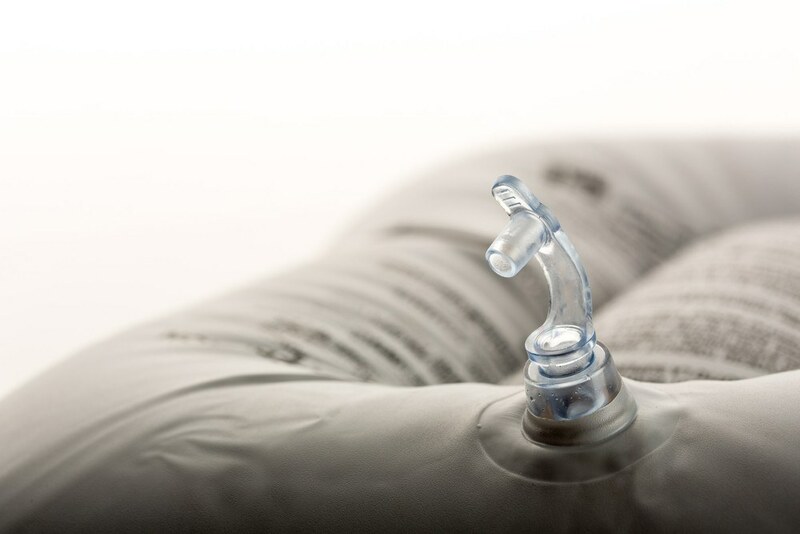 The inflation/deflation valve is very easy to use, and you can easily adjust the firmness of the pillow. What sets this pillow apart is the self-inflating feature that is very inflated and deflates. The maximum thickness is ideal for side sleepers, while back sleepers can adjust it very easily to desired thickness. The interiors have open cell foam for more comfort. When fully inflated, the pillow is 18 inches long, 10 inches wide, and 4 inches thick. It packs down to 13 inches long, 3.5 inches wide, and 3.5 inches thick, and fits snugly into a carry bag. The pack weight is only 6 ounces, which is still very light. Adjusting the firmness of the pillow is easy. Ideal for side sleepers. Stays in place well thanks to the non-slip material. Very easy to clean - you only need to wipe it with a damp cloth if necessary. The surface is smooth and soft on the skin. It also doesn’t make noise. The material doesn’t hold odor and sweat or moisture dry very fast. It’s not a space saver. Pack size is quite large for an inflatable. Backpackers are not always up in the mountains or deep in the jungle camping; you can find them in hostels or budget hotels too. That’s why I included a neck pillow on the list. Hostels, hotels, or other accommodations will likely provide a pillow, so I added a neck pillow for backpackers in transit. Backpackers are always on the go and often get shut eye in the plane, bus, train, or whatever vehicle they are in. That’s where a neck pillow comes in. 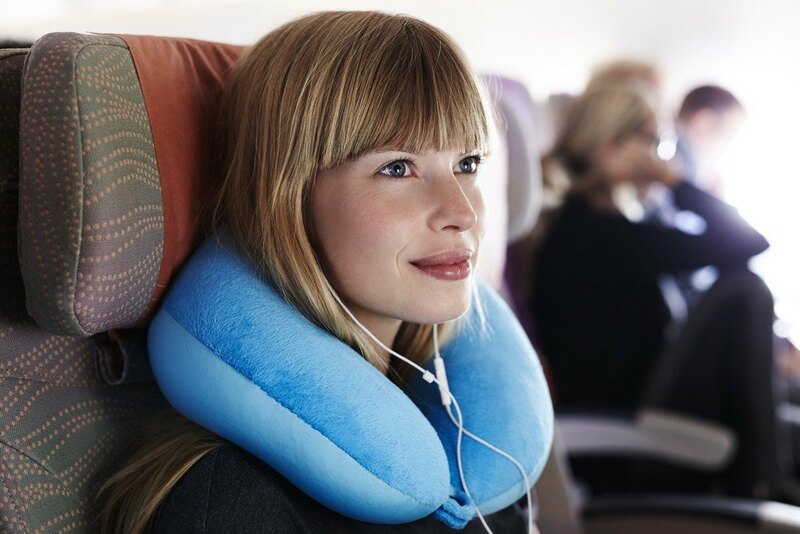 The Aeris Memory Foam Travel Neck Pillow is one of the best neck pillows on the market. It uses memory foam, which is very comfortable and supportive at the same time. The cover is a machine-washable plush velour material. It comes with a carry bag and packs into a nice compact size. You can hook it onto your backpack for convenience. Memory foam material is very comfortable and supportive. Packs into a convenient carry bag. You can sleep anywhere with it. Not ideal for backcountry use. We hope this helped you in your search for the best backpacking pillow. There are a lot of factors to consider, but going through them will lead you to just what you need. For backpackers, size and weight are the first two things you look into. That said, the best backpacking pillow has to be the Sea To Summit Aeros Pillow Premium. It’s the most compact and lightweight option, while still being considerably comfortable. However, not everyone has the same preferences and needs. What’s best for me might not be the best for you. The bottom line is that our versions of “best” are different and may depend on how you’ll use it. For instance, backpackers in hostels won’t need pillows as it will be probably available in their accommodation. However, they might want a neck pillow for the plane, train, bus, etc.